Life is filled with treasures if only we can recognize them. One of the treasures I witness daily is the resiliency of mother nature. As many of you know California was recently hit with wildfires that displaced many humans and wildlife. Just a week after the wildfire that affected my area, as per usual, a little rain came to wash the ash from the leaves. Then a mere few days later sprouts of green began to appear. We are now 8 weeks hence the fire and some of the hillsides are covered with the green of the grass and the sprouts of brush beginning to make a comeback. Some look up at the charred hillsides that have not yet transformed into what they will become and see only the destruction, I see the hint of growth that is beginning to emerge, knowing the hillside will not remain blackened forever. True, it is sad to see the oak trees that have been landmarks for hundreds of years charred, and many have seen the end of this incarnation. However with nature, nothing is ever for naught, and the ash from the trees will replenish the earth for seedlings to take root. Rebirth continuously evolves into something new, just as each cell in our body changes over the course of years, the same holds true for all of life. It is us, humans, that want to hold on to what was, a byproduct of us not living in the now but holding onto the past. Natures’ gift is everywhere, sometimes appearingimperceptible, nonetheless, it is not. One cell at a time she is transforming. Nothing is ever at a standstill. Leaves reach their maturity, continuing the cycle eventually falling to the ground as they make room for another, not to take its place but rather to extend the branch forward. Days after the fires ended a few squirrels appeared, but very few birds could be seen or heard. The rabbits that usually hop across my driveway were gone, the raccoons that raid my dog food were also gone. It was eerily quiet. Normalcy was yearned for, we all wanted our lives to get back on track and energy of the wildlife was a part of it. As time passed, neighbors gleefully reported to each other when deer were sighted and welcomed the evening serenade of coyotes. 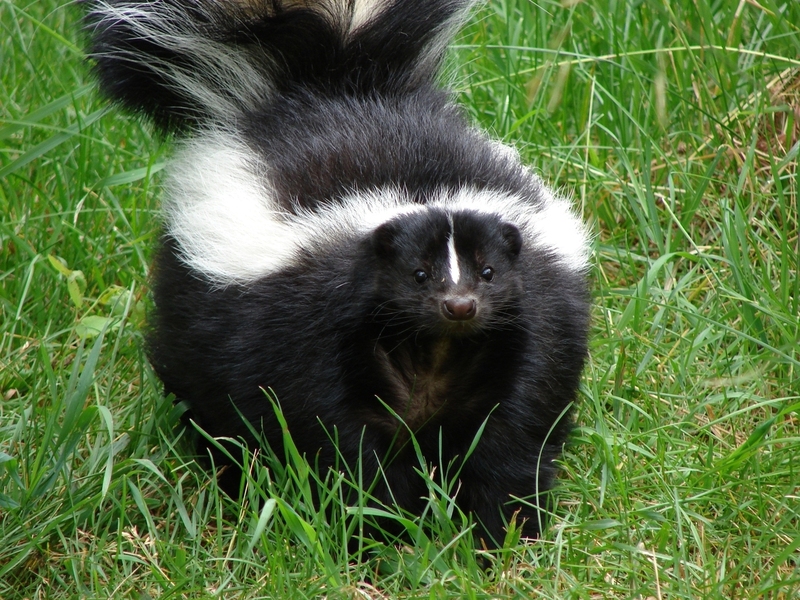 When I smelled, because I rarely see, the elusive skunk I was ecstatic. As if the skunk was a signal life was being restored, rabbits and birds began to reappear.They too had reemerged from their evacuation and hope was restored that not all wildlife had perished. A bluebird came searching for food, so I lined my deck rails with nuts and fruit, creating a feast for those that were hungry. In the midst of the destruction, some losing their homes, we forget that the wildlife too had lost their habitats. Animals are among my greatest teachers. They do not focus on what was, but on what is at hand. They hunker down when the weather requires it, and when time or circumstance permit they rebuild new habitat and find new food sources. Skunks are a part of my life. Every few days their presence is made apparent as their scent wafts into my window at night. It gives me hope that they too feel safe to return. My Let Go moments are often and varied throughout the day, and the skunk reminded me although their smell is potent in large doses, in small doses it can be the smell that restores a sense of normalcy. She understands that everything has its time. Changes are embraced as a natural function of life. There is no judgment of which season is better or worse, right or wrong, just what is. She allows time to do it’s bidding. She is not impatient for the seeds to sprout or the grasses to grow. The acorns will form as the grasses fade, then drop to the ground and be carried away to take root elsewhere. Nature does not dictate where the seeds will blow or on what terrain they will land. Not everything takes root, and some that do, do not always survive. Mother nature holds no remorse, just acceptance of what is, for she is adaptable. Like our own lives, not all ideas will take root, and even those that do, some will not flourish. Our relationships will transform, some will be everlasting like a century oak and others will be short-lived as a wildflower. What was, become memories just as the new becomes the norm…for now. Understanding The Let Go is an acceptance that everything has a time and place. Nothing is forever and nothing is ever completely lost, just transformed. Life lessons are everywhere if we are able to see the treasures that are before us. Shall we open our eyes to the possibilities of transformation?